One day–I couldn’t have been more than thirteen years old at the time–I was riding a monorail at Walt Disney World. A cast member (the blanket term for any Disney employee) was also riding in our car. She was still in costume and wearing her name tag, and I started talking with her. I can’t remember the bulk of the conversation, but I do know I asked her a bunch of questions about working for Walt Disney World. Walt Disney World, even then, had been a big part of my life. It’s entirely possible that I had thought about working there before, but as far as I can recall it was that random monorail meeting that really stuck the idea into my head. Several years later I was attending college in Orlando, less than an hour from Disney. You’d think that the very first thing I would have done upon moving to the area would have been to apply (or at least be in the parks every day), but the truth is that Disney became sort of an afterthought. I was simply too busy to apply for a job, and usually too broke to buy a ticket. Also, I didn’t have a car during my freshman year, so getting to and from the parks would have been challenging. I love Walt Disney World, but I think walking just over thirty miles (each way) every day is beyond even my devotion… slightly. When I finally did apply, it actually happened on a whim. After class one day in the Spring of my sophomore year, a good friend mentioned that she was heading out to apply for a job at the parks. Having nothing else to do, I decided to tag along. There was no advanced planning on my part, which is sort of funny when you consider how long I had been actually planning to someday work at Disney. We stopped at my place to clean up and get changed, then we headed out to the Walt Disney World Casting Center. The Casting Center is across from Downtown Disney, and the exterior looks like a cross between an office building and a castle. The doorknobs look like the talking knob from Alice in Wonderland, and inside there are statues and artwork of Disney characters. The entire place just looks like what you’d expect a Disney office building to look like–functional, but with a healthy dose of whimsy thrown in. Back then, in the long-distant year of 1995, the process went like this: you filled out a paper application and turned it in, then you took a fairly simple written math test (mostly involving making change), After that you and other applicants went into a screening room and watched a short video about how great and magical it is to work for Disney. Then you pretty much sat in a large waiting room, tried to keep yourself occupied in the days before smartphones, and listened for your name to be called. When it was, you were led into one of several rooms with one of several recruiters for your actual interview. I should mention that at this point in my life I looked about as “un-Disney” as I could get. I had hair past my shoulders, a full beard, and a pair of earrings in my left lobe. A far cry from the clean-cut look the company expects from its employees. Had I actually planned on applying, I would have probably made an effort to look the part, but due to the spur-of-the-moment decision I didn’t have the chance. While sitting and waiting, I was starting to get excited about the prospect of working at Disney. I had been going there for longer than I could remember, and had wanted to work there for so long, and now that I was actually applying–even though it happened more or less by accident–I found myself really hoping that I’d walk out of there with a job. My friend and I were among the last to be called in for interviews that day. Mine was with a young man who (like myself) was from Massachusetts, so when he saw that on my application we had started chit-chatting about ‘home’. He did ask a series of required questions, writing down my answers as we went, but the entire experience was very relaxed and kind of fun. It may have helped that I went in with no real goals or pre-conceived notions and was just sort of going with the rather ‘spur of the moment’ flow of the afternoon. Towards the end of the interview he casually told me that I was hired, and that I was going to be going to be an attractions host–the blanket term for the cast members who operate rides, get guests in and out of show theaters, et cetera. He then motioned to his own face. “You know you’ll have to…” he said, trailing off. The message was clear, though: the hair and beard would have to go. I knew before applying (years before applying, really) that this would be a thing if I were hired, so obviously I said that it was fine. Upon leaving the office I was beyond thrilled, and it took a moment for what had just happened to really set in. I had shown up that day with no real expectations, just along for the ride as it were, but now I had finally achieved something I had wanted to do for years. I was going to work at Walt Disney World! Unfortunately, my friend did not get a job, so I did my best to temper my excitement on the way home to not make her feel bad. In an ending befitting a Disney movie, though, she went to an audition a few weeks later and ended up being hired to work as a character performer in the parks. Soon she’d be in costumes entertaining guests as Dale, Winnie the Pooh, Roger Rabbit, and more. I shaved the beard shortly after getting home, and the next day I stopped at a nearby barbershop. I sat in the chair, simply told them that I got hired at Disney, and they knew exactly what to do–cutting my hair to cast member specifications. I did keep the earrings, though, taking them out before I started my shift and putting them back in at the end of my day. Next came orientation, which started as a fairly large class made up of several newly-minted cast members. On the first day we did a variety of “getting to know each other” exercises, and we learned the basics of being a Walt Disney World cast member. At this point we were all together regardless of what department we had been hired for. I remember meeting a guy assigned to parking during orientation, and every now and again during my time working there we’d cross paths and chat for a bit. I don’t know if personally I could stand outside in the heat directing traffic all day, but he loved it and was always cheerful when I saw him. I wish that I could recall more about the orientation process, but it’s been so long that I only have vague memories. I remember that one of the early things we did was stand up one by one and state our favorite Disney movies. Most people went with the obvious–Little Mermaid, Peter Pan, or another animated classic–but I had to be different and say Something Wicked This Way Comes. I know that we went into Magic Kingdom, and I’m fairly sure that we ended up in the Utilizers at one point. We had to memorize the names of all seven dwarves, and we had a crash course on how to draw Mickey Mouse’s face. I know that there was a lot of information while in our “class” involving the rules of working for Disney and impressing upon us all the high level of guest service that was expected. I do remember it being fun overall, though, and of course exciting because it was the first real step towards being out in the parks as a cast member. The next day we were all split off into our respective departments, so I went with a couple other new attractions recruits to our “audition”. I had been hired as an attractions host, but now it was time to find out exactly where I would be working within the parks. A cast member handed us each a paper with part of the Backstage Studio Tour spiel on it, gave us a few minutes to look it over, and then it was time to perform–standing up one by one in front of him (and each other) and giving the spiel as best we could. I was a theatre major (I started as an actor, but changed to the technical side pretty early on) so I had no issues with speaking in front of people, and I suppose it also helped that I had heard that spiel as a guest several times before. After we all took our turns and the cast member deliberated for a bit, I was informed that I would be working at the Disney/MGM Studios. Specifically, the Magic of Disney Animation attraction. Truth be told, I was actually a bit disappointed, because in my mind I envisioned myself working at the Haunted Mansion (my favorite ride). I even said this to the cast member who had conducted the audition. As the Haunted Mansion is one of the most popular rides in the parks, he admitted that he heard that a lot. He told me that he really liked the way I presented the spiel in my audition, and he felt that I should be somewhere where I’d have more of a “speaking role”. As an aside, he also mentioned that cast members at the Haunted Mansion are not supposed to smile and that this would be harder than I thought. At some point during all of this, I also got issued my photo ID. This would allow me to park in the employee lot and would be what I used to punch in and out each day. It also granted me access to the parks as well as discounts on merchandise and dining. There was something about having that little plastic card that really cemented the fact that I was an official Disney cast member. With orientation completed, I was assigned to a trainer (I wish I could recall names, but it’s been over twenty years) and scheduled for shifts at “my” park, the Disney/MGM Studios. Over the next week I would work side-by-side with this man as he taught me all he could about being a cast member. First I started out as his shadow, watching what he did and learning what I could. Gradually I started doing things on my own: taking on the spiels, getting constructive feedback, trying again. In addition to the Magic of Disney Animation, I would also sometimes be working at the Voyage of the Little Mermaid show and occasionally at the (at the time) Making of the Lion King exhibit, so there was a lot to learn! Each day, I would do a bit more. The trainer was still right there, but bit by bit he stepped away and I took over. By the end of the week, he was basically shadowing me just to be sure that I was good to go. In addition to the attractions themselves, I had a lot to learn about being a cast member. I had to know the basic layout of the entire park, from where attractions were to where to find the nearest restrooms. I needed to know phone numbers for important departments like first aid and security (or at least know how to quickly find them). I had to understand the flow of the work day, how to navigate backstage to the break room and commissary, and have at least a basic idea of what sort of situations I could encounter while working. I kept learning more about how to offer that Disney level of service, which is really an ongoing training process whether you’ve been there a day or a decade. Plus, of course, I was meeting so many new people. At the end of the week, though, my basic training was complete. 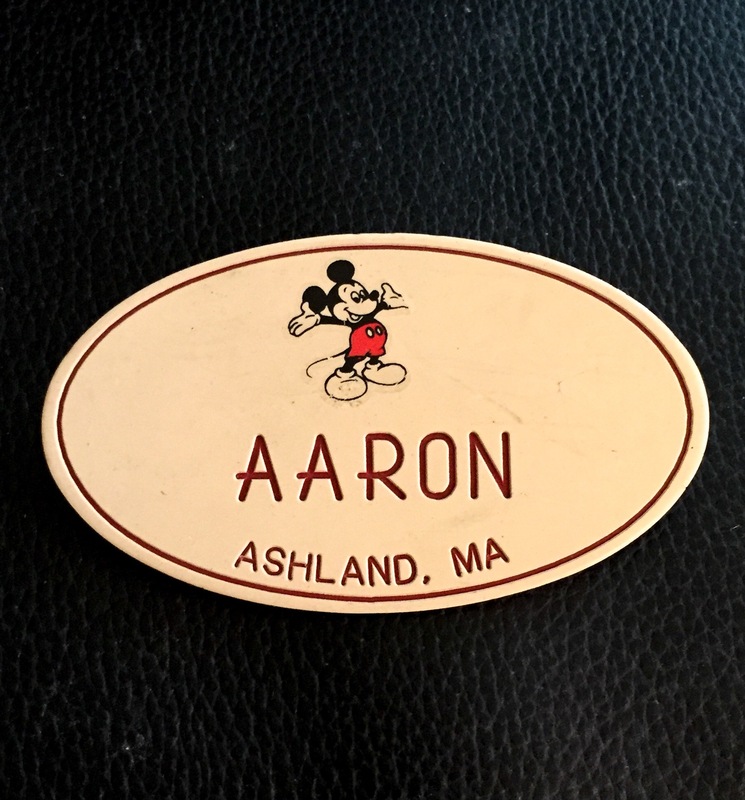 I knew my spiels, the flow of the attractions, and we (my trainer and I) felt that it was time to set me loose on my own… as a Walt Disney World cast member! Sadly, I don’t think there are any photos of me as a cast member. I do, however, still have this. It’s a bit yellowed with age, but it’s still a much-loved souvenir from when I worked for Walt Disney World. Be sure to check out “The Cast Member Diaries Part Two: Spreading The Pixie Dust” to learn more about my time as a Walt Disney World cast member. This entry was posted in Magic, Misadventures, Nostalgia and tagged Disney, Walt Disney World. Bookmark the permalink.